Inspired by the capsicum rice, I decided to try out the rice with cabbage and broccoli. Like certain things need to be kept in certain places in the house, I have this notion of making specific things with some vegetables and rarely look beyond that. When I think of cabbage, it is always a simple stir fry partly because that is what the kids like and the same goes for broccoli. Only in the recent days I have been including broccoli in a variety of dishes as you can see here. This rice was a welcome variation and is going to be part of the menu often since rice is one of my favorites too. I also make the masala in bulk and that makes putting the rice together very easy on week nights. Off to the recipe. Rice mixed with cabbage, broccoli and mild spices. 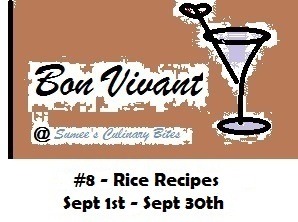 Cook basmati rice and keep aside to cool. I cook it in the ratio of 1:2 (rice:water). Heat oil and splutter mustard seeds. Add 1 tsp urad dal, 1 tsp channa dal and peanuts. Saute until the dals turn golden brown. Add onions and green chillies and saute until onions are done. Add cabbage, broccoli, salt and turmeric and cook until the vegetables are done. Add the cooked and cooled rice. Mix gently. In the meantime, saute coriander seeds, 1/2 tsp urad dal, 1/2 tsp channa dal, red chillies and asafoetida. Allow to cool and powder using a blender or coffee grinder. Add the powder to the rice. Mix and add lemon juice. Mix again. Lemon juice adds a nice flavor and is totally optional. Making the masala in bulk saves time when putting this rice together. Can also add the masala for kootus. 1. Cook basmati rice and allow to cool I cook it in the ratio of 1:2 (rice:water). Heat oil and splutter mustard seeds. Add 1 tsp urad dal, 1 tsp channa dal and peanuts. Saute for a minute until the dals turn golden brown. 2. Add onion and green chillies. 3. Saute until onions are done. 4. Add broccoli and cabbage. 5. Add salt and turmeric powder. 6. Cook until the vegetables are done. 7. Add the cooked and cooled rice. 9. Meanwhile, fry coriander seeds, 1/2 tsp channa dal, 1/2 tsp urad dal, red chillies and asafoetida. 10. Dals are golden brown. Allow to cool. 11. Take in a coffee grinder or blender. 12. Blend to a powder. 13. Add the powder to the rice. Mix. 15. Toss it all together. Healthy rice with a tinge of lemon flavor ready. We had it with spinach raita. I too like rice like you I can eat rice three times a day 365 days.The idea of making the spice in bulk is good.I am definitely going to try this recipe.